by Gary Bauer: We have been warning for some time that the health care reform bill would likely include taxpayer subsidies for abortion-on-demand. In recent days, many folks have emailed us responses they have received from their members of Congress who deny that abortion is being covered in the bill. At least one congressional liberal is now publicly suggesting otherwise. Our friends at LifeNews.com report today that California Rep. Zoe Lofgren told a town hall audience, “Abortion will be covered as a benefit by one or more of the health care plans available to Americans, and I think it should be.” Since Rep. Lofgren is a member of the pro-abortion majority in Congress, I take her at her word. Since President Obama has called “reproductive justice” “one of the most fundamental rights we possess,” and since he pledged support for the Freedom of Choice Act, which would codify abortion as a constitutional right, I assume he wants abortion covered. But we don’t have to assume anything. We’ve told you about pro-life amendments that have been defeated in the House and the Senate. We’ve told you that pro-abortion groups like NARAL and Planned Parenthood are demanding abortion be covered. And even the Associated Press admits abortion will be covered. Today, I was honored to add my name to a broad coalition, being led by former Attorney General Ed Meese, of pro-family leaders who are taking a stand for sanctity of life by opposing taxpayer-funded abortion as part of any health care reform plan. Polls show that huge majorities of Americans oppose taxpayer funding of abortion, so this ought to be an easy decision for politicians who are truly representing the people. Unfortunately, it is clear from the responses that some of you are getting that many liberal Democrats are more interested in representing the extreme pro-abortion agenda of NARAL and Planned Parenthood. 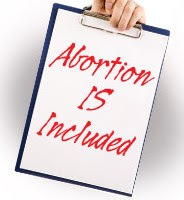 Tags: abortion, Gary Bauer, nationalized healthcare To share or post to your site, click on "Post Link". Please mention / link to the ARRA News Service. Thanks! I deeply oppose abortion yet I have no say in my tax dollars being used to do so? Crazy! So when do I loose my right to choose?? I thought we as women get the right to choose...or have we forgotten the other side of choice, the one that makes it a choice. Sorry - I don't trust any of them. If it gives ANY funds to Planned Parenthood or women's clinics or....or....or. If it does not SPECIFICALLY say that the Federal government WILL NOT fund any abortions......then it is IN. Abortion is murder. Now we are stuck paying for it!!! You have got to be kidding me.